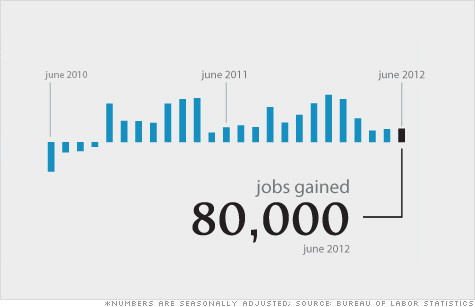 The U.S. economy added 80,000 jobs in June, hardly an improvement over 77,000 jobs added in May. NEW YORK (CNNMoney) -- Hiring was lukewarm last month, with employers adding jobs but not enough to bring the unemployment rate down. The economy added 80,000 jobs in June, the Labor Department reported Friday, barely an improvement from the 77,000 jobs added in May. The unemployment rate remained at 8.2%. Economists have attributed the strong hiring in the winter to unusually warm weather. Now they say fears about Europe's debt crisis, China's slowdown and fiscal cliff looming in the United States are holding employers back. "It's hard for an employer to hire somebody when you don't know what the tax rates are going to be in six months. There's just too much uncertainty," said John Silvia, Wells Fargo chief economist. June's weak growth added to fears that the recovery is waning. The economy needs at least 125,000 jobs added each month just to keep up with population growth. It needs even more to bring the unemployment rate down. Other recent reports have shown retail sales are slowing, the manufacturing sector is contracting and consumer confidence has fallen. "Today's report is the rotten cherry atop the half-baked economic news of the last few months," Chris Jones, economist with TD Bank said in a note. On the upside, the housing market seems to be improving, with both home prices and home sales rising recently. Construction companies added 2,000 jobs in June. While that's not much, it's still the first time since January that the economy has added construction jobs. Economy: How are you coping? Workers with a bachelor's degree or higher had a 4.1% unemployment rate, whereas workers with just a high school degree had an 8.4% rate. "We continue to hear from companies that it's a two-tier labor market," said Brian Kropp, managing director at the Corporate Executive Board. "For people who have been employed with professional and technical skills, it's a decent job market. But for the rest of the workforce it's still very difficult." Overall, the job market has a long way to go to climb out of the deep hole left by the financial crisis. Of the 8.8 million jobs lost, only about 3.8 million have been added back. The so-called underemployment rate rose to 14.9% in June. That rate includes the unemployed as well as people who could only get part-time positions and who have looked for a job at some point in the past year.